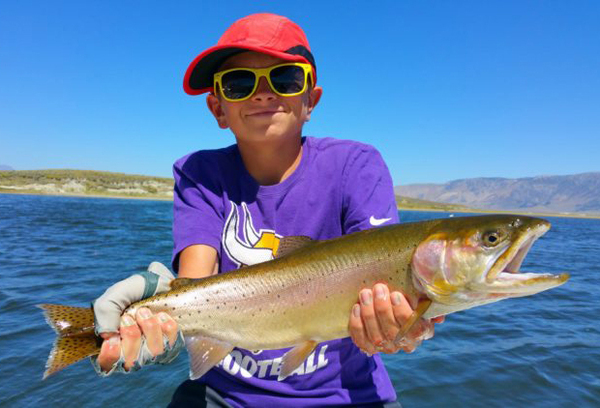 Young gun Tyler Telleson got this great cutthroat in the north end with guide Doug Rodricks. Way to go “big T”! The fish have turned the corner at Sandy Pt. and are now showing up in concentrations in the north arm, & Layton Springs. The CDFW has been stocking sub-catchable triploid rainbows, & browns the last couple weeks, & those little rascals are showing up at times all over the lake now. The submerged aquatic weeds are now protruding making the deeper weed lines easy to identify. Water clarity is very good with no algae bloom. Tubers should be looking to troll some perch fry/damsel nymphs along the weed lines. 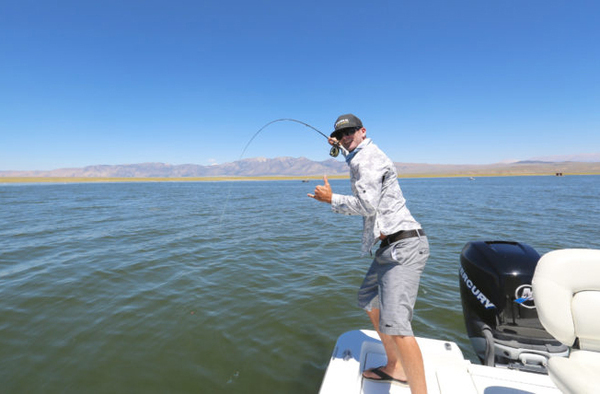 Hang your flies above a clean mud bottom in close proximity to a hard weed line for consistent action. Chironomid hatches have been light recently; however the fish are still hunting the larva close to the bottom. Broken back midges, crystal zebra, or tiger midges (big ones), and damsel nymphs are all good calls while fishing below an “sliding” Under-cator. My go to rig the last few days has been an Assassin; or Drifters Punk Perch #14/16 as the upper, with a dark crystal tiger midge (#14), or broken back copper tiger (#16) as the larva pattern. Keep the tigers 6-12 inches off the deck. I have also been using twin Assassins; or a Punk Perch with an Assassin dropper along the weeds. Keep them a foot or more above the bottom. ***Special angling regulations begin on 8/1/16 and will continue throughout the remainder of the season on Crowley. The entry gate to the marina opens at 7am instead of 6am now.